We love them at nordicwellbeing.com! My grandmother always used to say that most things that you prepare taste even better the next day if you rehash them a little bit. I guess she had to develop this approach having lived through two world wars. The thing is, I tend to agree with her. I don’t know whether it has to do with actual taste or just the satisfaction of not wasting food. Who doesn’t have a sealed tub of leftover cooked pasta in their refrigerator? Please raise your hand. Aha! As I suspected, no one is raising their hand. As I had just pulled this year’s beets out of the ground in my kitchen garden yet didn’t feel like spending too much time cooking, I decided to put two and two together and came up with this little number that is just superb. 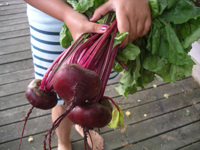 I know you must think that we are beet-lovers at nordicwellbeing.com (yes we are! see our Nordic Wellbeing Cookbook). Place the pasta in a microwave-proof bowl. Chop beets into bite-size wedges and add to the pasta without blending. Crumble over goat’s cheese and add hazelnuts. Cover and heat in the microwave until warm (1-2 minutes on maximum). Drizzle over the olive oil, season with salt and pepper and toss. Enjoy with a green salad. 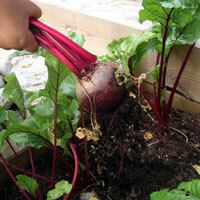 * Cooking beets: Remove most of the stalk leaving about 2-3 cm or 1 inch on the beetroot. Wash and place in a cooking pot. Cover with water and add a bit of salt. Bring to boil and then lower heat leaving to cook about 30 minutes or until you can easily pierce the beets with a fork or other. Drain away the water and allow to cool. Remove the skin to use in food preparation. It should slide off easily. If you do like beets (a wise health choice), please look no further, check Paavo’s Bytes and The Nordic Wellbeing Cookbook. Along the lines of food and frugality, please do check out the Ethnographic Museum in Stockholm which is now home to the Manna Exhibition which has toured Sweden, Denmark and the US. The new cafe, MatMekka, established simultaneously with the exhibition is well worth a visit! Since I’m on great Finnish food ideas and root vegetables this week, I thought I’d throw in that little extra that will add great color and flavor to your holiday season table. I just cannot say enough good things about beetroots. Just a superb food. If you don’t eat them yet, start! Want to learn more about them? Check Paavo’s Bytes for May 2008 in More Bytes. Melt the butter in a pan and saute the onion and beetroot. Lower the heat, cover and allow to ‘sweat’ until cooked. Blend in the soured cream and wine vinegar. Season with sugar, salt and pepper. Place on a warm serving dish and sprinkle over parsley. Typically, this dish is served with mashed potatoes piped around it. However, you can go for a lighter version and simply serve with my light recipe for mashed root vegetables as a separate dish. If you are wondering how to avoid ending up with pink fingers after making this dish, wear disposable kitchen gloves.